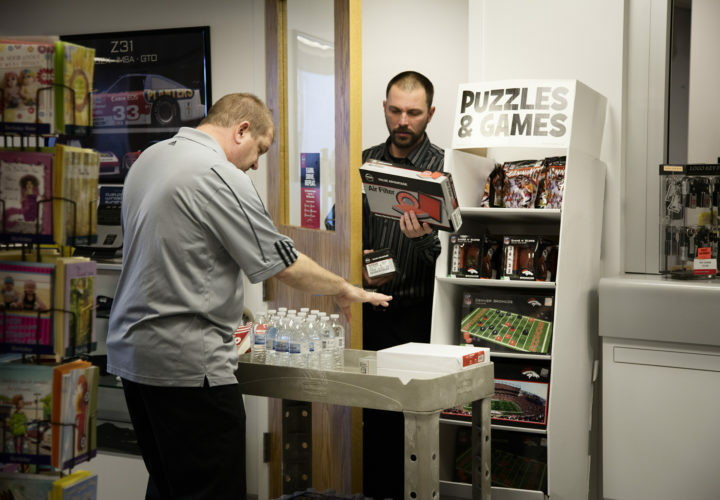 “Hi, would you like a water or popcorn?” Brian Nordstrom asks customers in the service lobby of Larry H. Miller Nissan in Highlands Ranch, Colorado. Brian looks tired and determined as he pushes a cart filled with popcorn, bottles of water and car parts. His pace is slow and steady. A scar runs along the top of his skull. His work is important to him. Before his accident, Brian quickly made a good impression at Larry H. Miller Nissan. He often worked six days a week doing window tinting. On Saturdays, his sixth day, he would bring in doughnuts for all the service technicians. Two years ago Brian’s life came to a halt. While on a lunch break with a coworker, Brian’s car collided with a city bus. The bike rack on the bus broke through his windshield and hit him in the head. “I saw Brian in the car. It was hard to tell whether he was breathing or not. There was blood. The car was obviously totaled. It was tough. We were scared,” says Matt Carpenter, the service director for Craig Hospital Foundation. Matt was one of the first to arrive at the accident scene. Ten of Brian’s coworkers followed the ambulance to the hospital. They weren’t sure if he would live. The service department rallied around Brian’s family, bringing food to the hospital for weeks. Brian’s family rallied around the dealership. His parents continued his doughnut tradition, bringing in a dozen every weekend. “Even though Brian wasn’t here physically, he was here spiritually and mentally; everyone was thinking of Brian,” says Matt. For two years, Brian has dealt with the lasting affects of a traumatic brain injury. It hasn’t been easy. 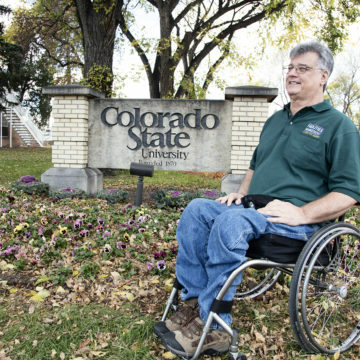 After the accident and initial rehabilitation at Craig Hospital, Brian went home. 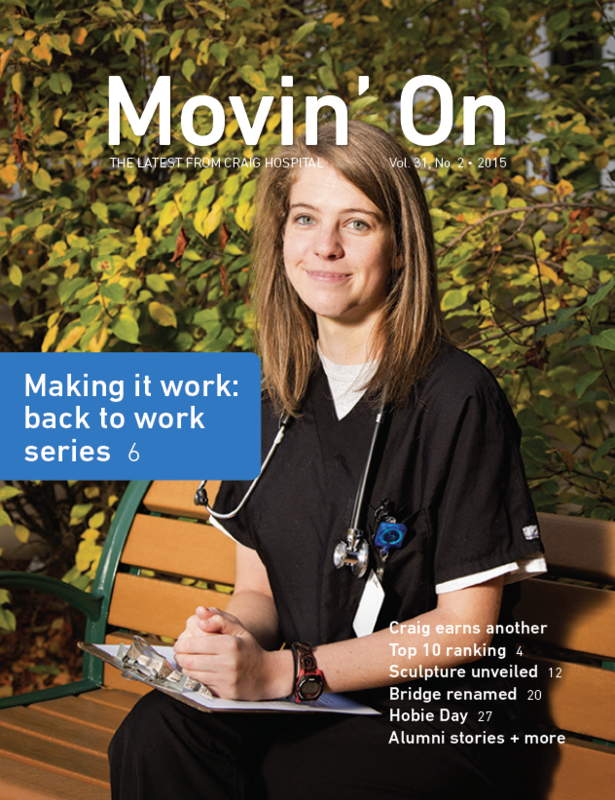 “Many of our patients like Brian are used to being breadwinners in their families, and really they just long to have that back again,” says Kelly Lombardi, Community Reintegration Specialist at Craig Hospital. Brian had worked his entire life. He felt lost at home. During an interdisciplinary outpatient evaluation, Brian met with Craig Hospital’s Community Reintegration Team. 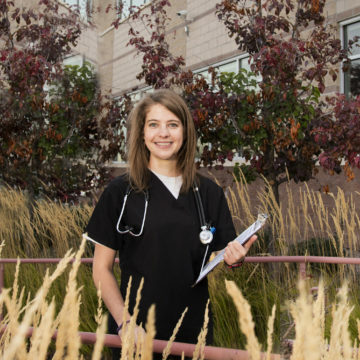 Community Reintegration is a unique Craig Hospital program that helps patients address their needs returning to home, work, and school. The program is funded through the Craig Hospital Foundation. From their first meeting, Brian told Kelly he wanted to get back to work. “We weren’t certain if going back to work was going to be a good fit for Brian. But he hung in there,” says Kelly. Brian was concerned he was not hirable. “Because of my injury, because of the way I talk, because of the way I look, because of the way I am, because of my attitude,” he says. Many times people with brain or spinal cord injuries run into barriers trying to get hired. They often need modified job responsibilities and hours. Larry H. Miller Nissan stepped up to the challenge and worked with Kelly to tailor a position for Brian’s new abilities. “We wanted to make sure one of our family members was able to get back to where he had been prior to the accident. We knew that sitting at home was not going to allow Brian to get the social interaction and the physical rehabilitation he could get here,” says Matt. Larry H. Miller Nissan in Highlands Ranch, Colorado, created a special position for Brian—customer service concierge. “I know they created this position for me, and I’m very thankful. It’s been very good for me. The dealership created a special position for Brian—customer service concierge. These days, Brian brings the doughnuts on Saturdays for the technicians on his own. He also bakes cookies for the staff at the dealership and brings in a Crock-pot with his famous homemade green chili. He helps out where he can and works about 12 hours a week. “What it does for your employees and the morale in your store can far outweigh any salary or compensation you can give to an employee. It creates loyalty and creates an atmosphere of love and happiness and smiles,” says Matt. As Brian slowly walks through the dealership, people smile when they see him. He says he’s happy to have a sense of purpose. “I know they created this position for me, and I’m very thankful. It’s been very good for me. My mom and dad said they could already see a difference in my balance,” says Brian.